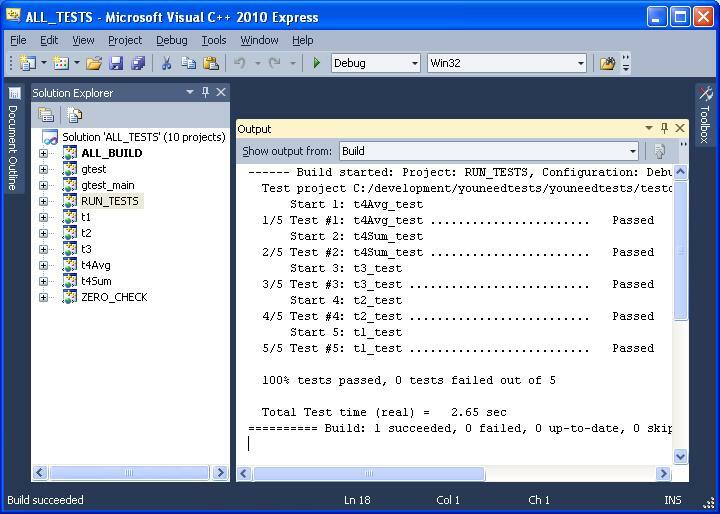 I've updated YouNeedTests, my cross-platform tool for extracting and building C++ unit tests embedded in source code comments, to make it usable on Microsoft windows systems too. Here's a basic tutorial on how to set it up and get started on windows. Python 3.2 (or newer): get it from the python website. Mako: get it from the mako templates website. I've installed the latest available version 0.5.0 using Distribute. CMake: get it from the cmake website. YouNeedTests: you can either install git and clone the gitorious repository (this is easy via the installshield of git extensions) or you can head over to the gitorious repository and download the master branch as a tar.gz package (then you will also need a tool like 7-zip to unpack the package). A C++ compiler. Strictly speaking, this is optional, but obviously YouNeedTests won't be very useful without one :) I've installed visual studio 2010 Express edition (free download) from the microsoft website. Note:the google test framework is included in the YouNeedTests tool. YouNeedTests comes with a run.bat script that runs YouNeedTests on some sample testinputs folder. In a first step, run.bat will delete the testoutput folder if it already exists. In a second step, "The "run.bat" will create a testoutput folder with a file called CMakeLists.txt and a series of folders containing automatically generated code (one folder per testsuite). Run.bat is a very short file, and I encourage you to take a look (and correct the paths to your python installation if needed). to get an overview of supported environments. When run.bat has finished, you should find a lot of files in your testoutput folder (imagine having to create all those by yourself to get a feeling for what YouNeedTests could do for you). 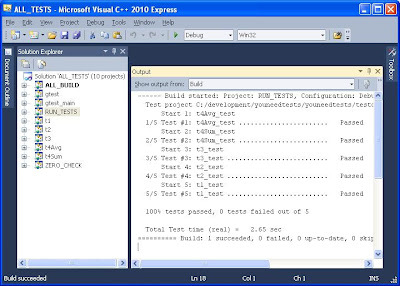 You want to open the ALL_TESTS.sln file in Visual Studio 2010 Express. Inside the solution you will find different projects. The ALL_BUILD project: build this to build the googletest framework and the tests extracted from the c++ comments. The t1, t2, t3, ... projects: setting one of those as startup project will run only that testsuite. Running a testsuite separately like this allows you to get much more detailed test output. Unfortunately, the console window containing the test results quickly disappears when the test finishes. You may want to run the test executable from a dos window instead so you can inspect the results. , it means you forgot to build the ALL_BUILD project first. Right-click ALL_BUILD in the solution explorer in visual studio, and click Build. variable.) An alternative would be for YouNeedTests to copy the .dll files into each of the testsuite folders, but I'd rather not do that (the more tests you have, the more copies of gtest.dll are needed).